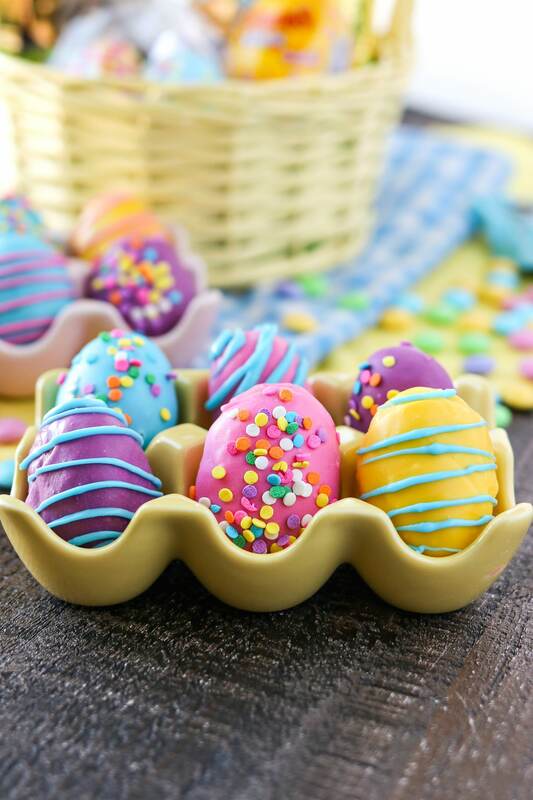 Cookie Dough Easter Eggs with M&M’S® – Chewy edible chocolate chip cookie dough truffles with M&M’S® Milk Chocolate, rolled into egg shapes, and dipped into fun colored candy melts to make them look like Easter eggs. The perfect treats to make for Easter! We’re about a month away from Easter, ladies and gentlemen. Have you started decorating and planning yet? I started WEEKS ago. I think I stressed out the lady in front of me in the check-out counter at Walmart because she kept telling me that she couldn’t believe Easter was already here and she didn’t have anything for her grandkids yet. You still have time, lady! One of my favorite memories from Easter was shopping for and receiving Easter baskets. One year, during an Easter egg hunt, I found an egg with a card in it and thought I’d been duped. Where’s my candy?! Little did I know, that card meant that I won a HUGE Easter basket. Jackpot! So. Much. Candy. And not just one kind of candy – no, no,no. There was basically every type of candy you could imagine. Well, at least that’s what it felt like. It was the most magical day. To this day, Easter baskets (and, honestly, gift baskets of any kind) are a super exciting treat for me. So for today’s post, I want to share an awesome treat that’s perfect for packaging in your Easter basket and also show you how I fill my basket to make for a #SweeterEaster. My treat for you guys today are these super festive and ultra adorable Cookies Dough Easter Eggs with M&M’S®. There are very few things out there better than cookie dough. I purposely under-bake my chocolate chip cookies so that I get that gooey, cookie dough center. I wanted to capture the essence of that yummy cookie dough but make it edible and packagable. I don’t think packagable is a word but you know what I mean. Since we’re not baking these truffles, I took the baking soda and egg out of a classic chocolate chip cookie dough recipe and added a little milk to add back the extra moisture missing from the egg that we took out. And so the cookie dough truffle was born! To make these truffles even more magical and perfect for Easter, I added in M&M’S® Milk Chocolate (you can also use M&M’S® White Chocolate, which is brand-new and exclusively at Walmart! ), shaped them into festive Easter eggs, and decorated them with my favorite bright candy melts. I know these eggs look like they took a lot of work, but they really didn’t! The dough takes the same amount of effort as your chocolate chip cookies. Then, all you have to do is shape them and dip them in colored candy coating, throw on a few sprinkles and…Voila! You have a gorgeous Cookie Dough Easter Egg. Once I let the coating on each egg dry, I wrapped them up in little goody bags. Now, they’re ready to be handed out to friends or packaged in Easter baskets, which is, of course, what I did. I made a cute little Easter basket with a few of my favorite goodies that I was able to pick up at Walmart. The baskets, too! I love that I didn’t need to make trips all over town to get the Easter goods that I needed. What a relief! Without further ado, let me run down what all went in my baskets. I bought medium-sized baskets and filled each of them with a little paper grass so the candy wouldn’t sink to the bottom and become a cluttered mess. The goodies I included in my baskets were my adorable Cookie Dough Easter Eggs, goodies from the Mars variety bag, a couple STARBURST® Filled Eggs, and, my favorite, a few DOVE® Peanut Butter Eggs. These DOVE® Peanut Butter Eggs are brand new so I was super eager to try them. Spoiler alert: they are silky smooth and IRRESISTIBLE. They’re exclusively at Walmart so don’t forget to pick yours up while you’re there! In fact, you can get all of these goodies at Walmart in their Seasonal Candy aisle. Check them out on the shelves below so you know how to find them! Now that you know all the contents of my basket, how are you going to decorate yours? Get more inspiration at Walmart’s Mars Easter site. Comment below with your favorite ideas! Hope you guys enjoyed this post! The recipe for the Cookie Dough Easter Eggs (and some more yummy treats) is located below. Beat butter and brown sugar together with a mixer until light and fluffy. Add milk and vanilla and beat until combined. Add flour and salt and mix until combined. Add mini chocolate chips and M&M’S® Milk Chocolate. Using a spatula or spoon, gently mix into cookie batter. Scoop about a tablespoon of dough and form into an egg shape. Place on a platter or baking sheet. Repeat with rest of the dough. Place eggs in the refrigerator to chill for 30 minutes. If you are using multiple colors of candy melts, decide how many eggs you want for each color. I used four colors (6 ounces of each color) so I had 7 eggs of each color. Melt the first color of candy melts in the microwave. Dip your designated eggs into the first color. Using a fork, remove from candy coating and shake off extra coating. This is important so that the coating doesn't pool too much and disfigure your egg. Place on platter and quickly sprinkle with sprinkles before the coating dries. Skip this step if you rather stripe your eggs with leftover coating. Repeat with other eggs. Then, move on to your next color. Repeat until you've coated all your eggs. Let eggs dry for about 10-15 minutes to let coating set. If you decided to stripe your eggs instead of sprinkle them, fill ziplock bags with leftover coating. Snip off a small corner off of the ziplock bag. Drizzle coating quickly over the eggs. Let them set for about 10 minutes to let stripping set. You can serve at room temperature. But if you prefer a firmer filling, you can refrigerate instead. Enjoy! *With the recent flour recalls due to food-borne illnesses, it may be unsafe to consume uncooked flour. Therefore, I strongly recommend spreading the flour on a baking sheet and baking at 350 for 5 minutes to kill any present bacteria. Not sure why you can’t see it. But I will create a PDF and email to you. Let me know if you don’t receive it! YUM! I’m so in for these. I’m a big fan of cookie dough, and these look amazing. Thanks so much! You’re gonna love these!! These are too cute and look so yummy. These are the cutest and they look delicious! I have to make them!!! Those looks so delicious…combining two of my favorite desserts: m&ms and cookie dough! This is such a great idea–who doesn’t love cookie dough? I like my cookies gooey too! Yum! I love Easter Baskets – it feel slike forever since I made one! This is such an awesome idea! I have got to make these and try them out – so yummy! What a beautiful and yummy treat that’s perfect for the Easter holiday! Not to mention I love cookie dough and m&ms! These look delicious. Fantastic idea. Now this is something I would enjoy making and decorating for Easter. these sound like the greatest thing I have ever seen! This is so cute! My kids would love this. Def trying it! You’re so right! It’s a fun activity to do with kids because it’s so hands-on and creative. I hope you guys have a great time making these! Oh gosh, this looks so indulgent and HEAVENLY! And I love that there’s no raw egg in this cookie dough! 🙂 Safe to eat plenty of! love how you decorated them !! !